Jeffersonian republicanism People should control government; simple government best. 1 Jeffersonian republicanism People should control government; simple government best. 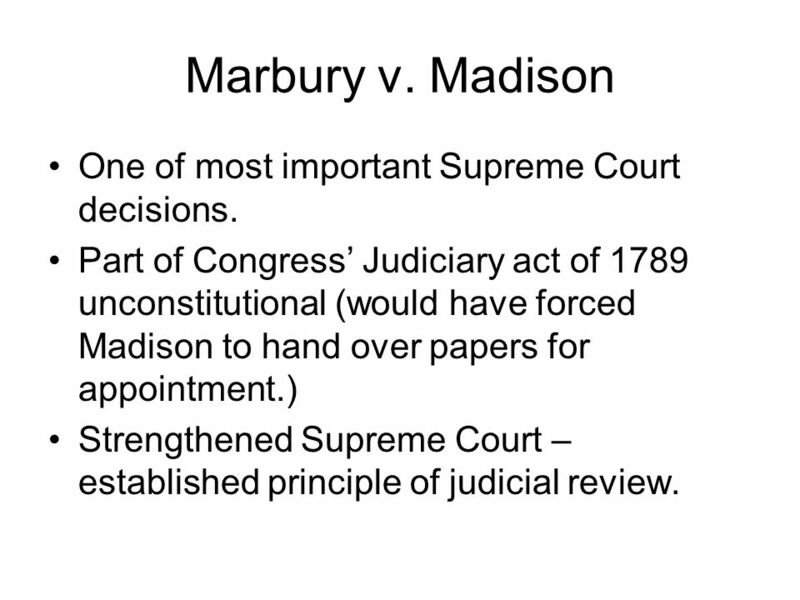 2 Marbury v. Madison One of most important Supreme Court decisions. Part of Congress Judiciary act of 1789 unconstitutional (would have forced Madison to hand over papers for appointment.) Strengthened Supreme Court – established principle of judicial review. 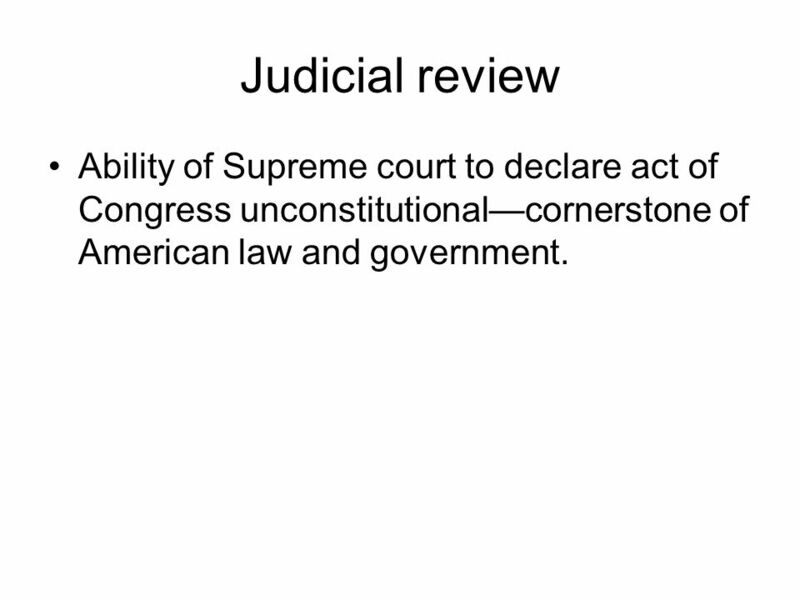 3 Judicial review Ability of Supreme court to declare act of Congress unconstitutionalcornerstone of American law and government. 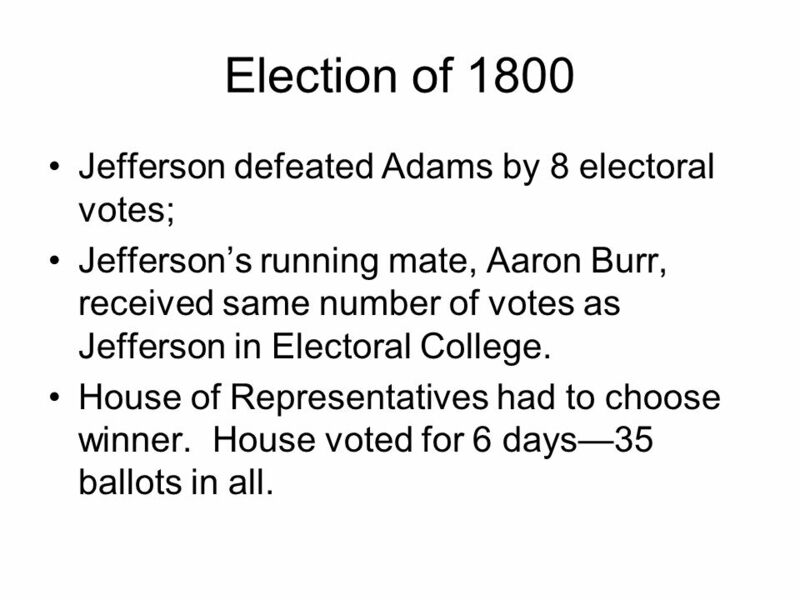 4 Election of 1800 Jefferson defeated Adams by 8 electoral votes; Jeffersons running mate, Aaron Burr, received same number of votes as Jefferson in Electoral College. House of Representatives had to choose winner. House voted for 6 days35 ballots in all. 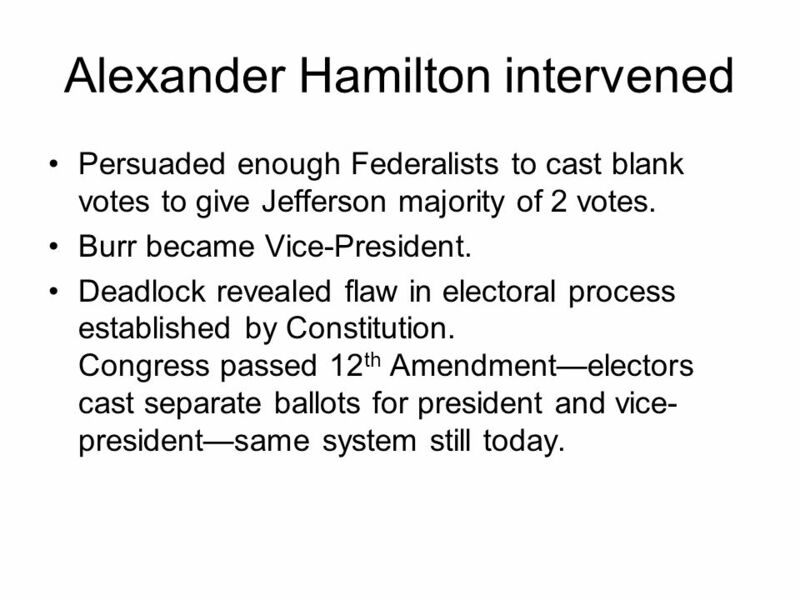 5 Alexander Hamilton intervened Persuaded enough Federalists to cast blank votes to give Jefferson majority of 2 votes. Burr became Vice-President. Deadlock revealed flaw in electoral process established by Constitution. Congress passed 12 th Amendmentelectors cast separate ballots for president and vice- presidentsame system still today. 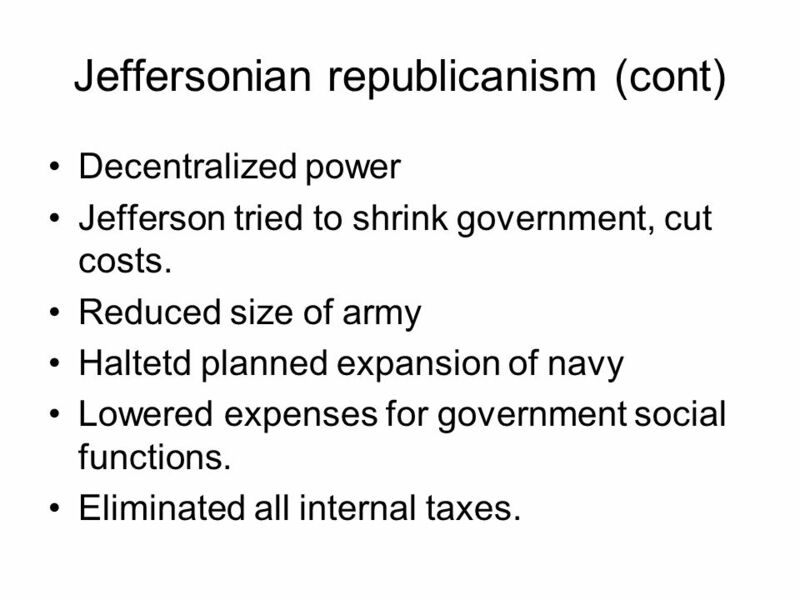 6 Jeffersonian republicanism (cont) Decentralized power Jefferson tried to shrink government, cut costs. Reduced size of army Haltetd planned expansion of navy Lowered expenses for government social functions. Eliminated all internal taxes. 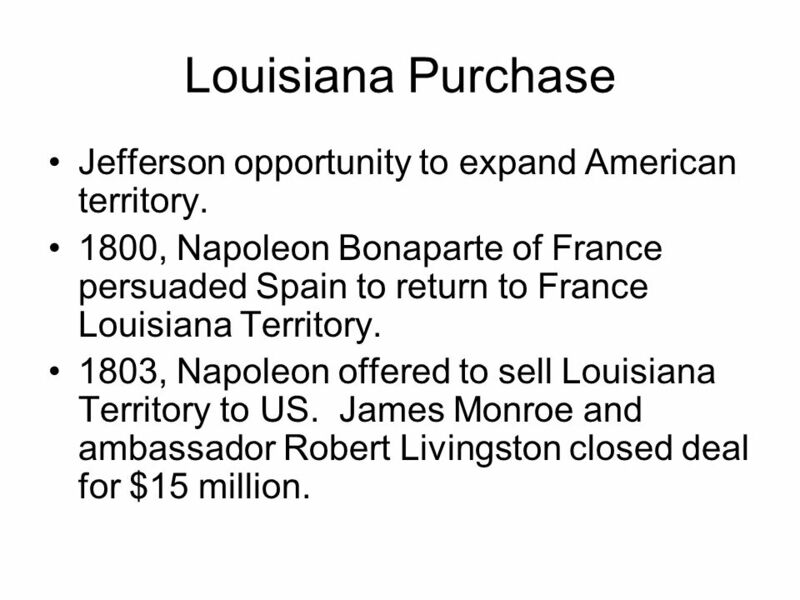 7 Louisiana Purchase Jefferson opportunity to expand American territory. 1800, Napoleon Bonaparte of France persuaded Spain to return to France Louisiana Territory. 1803, Napoleon offered to sell Louisiana Territory to US. James Monroe and ambassador Robert Livingston closed deal for $15 million. 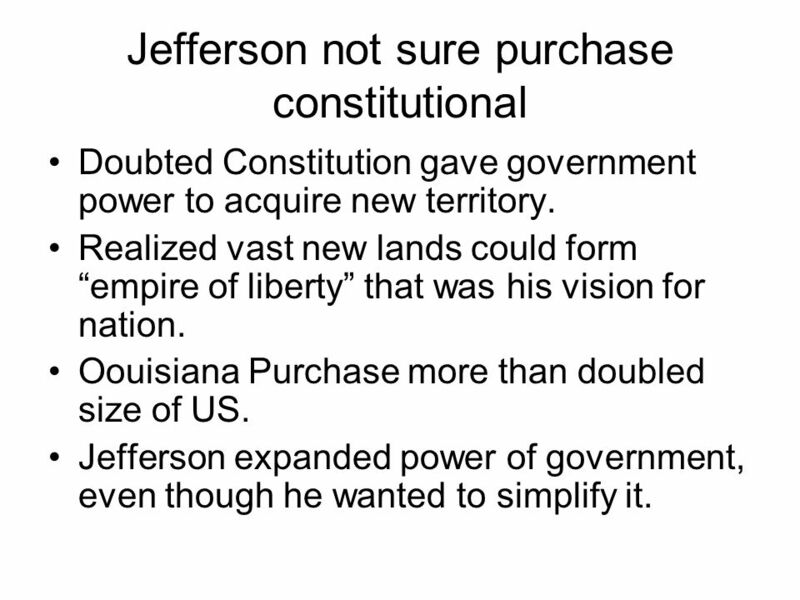 8 Jefferson not sure purchase constitutional Doubted Constitution gave government power to acquire new territory. Realized vast new lands could form empire of liberty that was his vision for nation. Oouisiana Purchase more than doubled size of US. Jefferson expanded power of government, even though he wanted to simplify it. 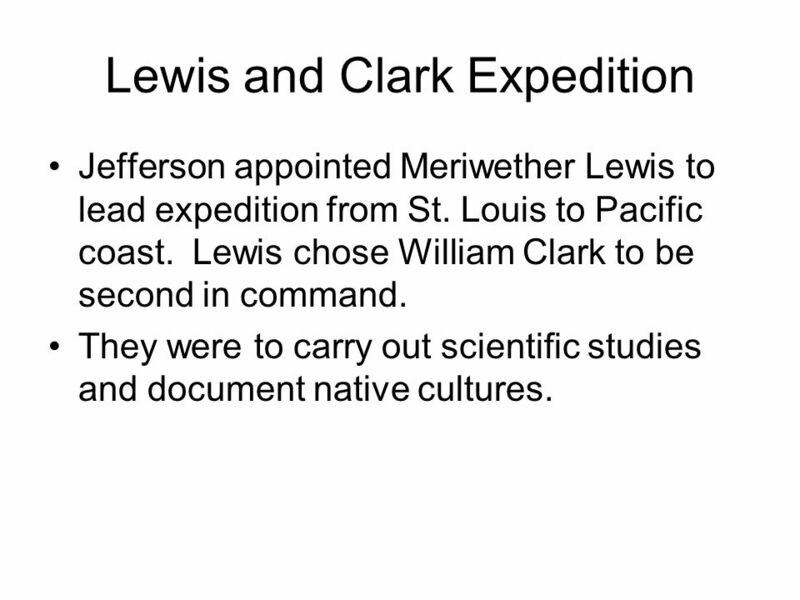 9 Lewis and Clark Expedition Jefferson appointed Meriwether Lewis to lead expedition from St. Louis to Pacific coast. Lewis chose William Clark to be second in command. They were to carry out scientific studies and document native cultures. 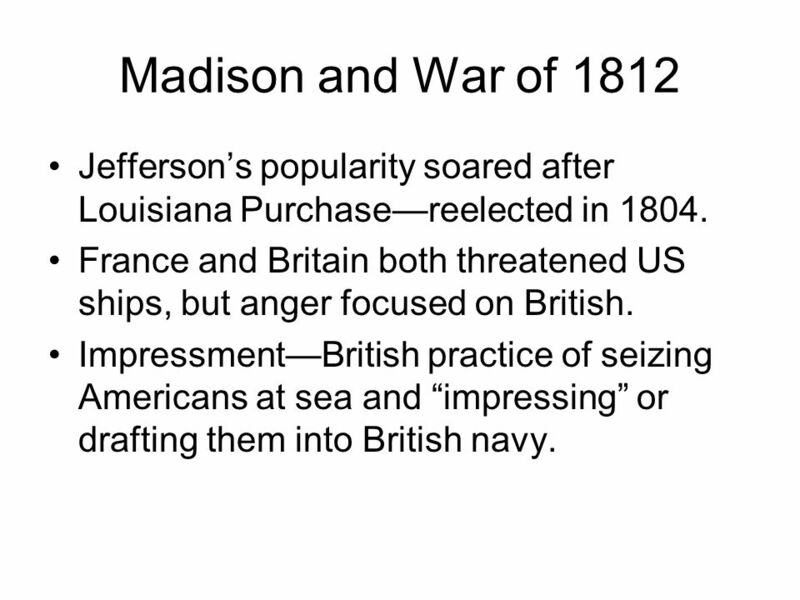 10 Madison and War of 1812 Jeffersons popularity soared after Louisiana Purchasereelected in 1804. France and Britain both threatened US ships, but anger focused on British. ImpressmentBritish practice of seizing Americans at sea and impressing or drafting them into British navy. 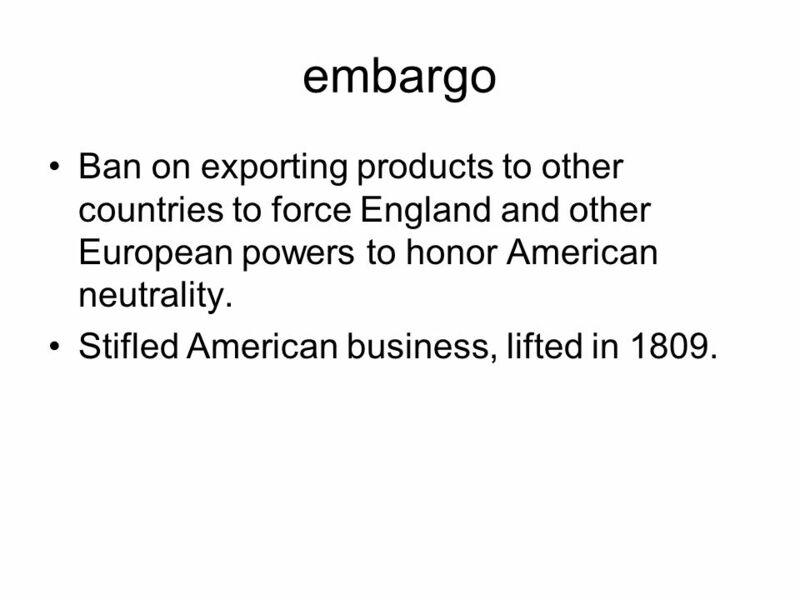 11 embargo Ban on exporting products to other countries to force England and other European powers to honor American neutrality. Stifled American business, lifted in 1809. 12 War hawks Young congressmen from west and South demanding war. 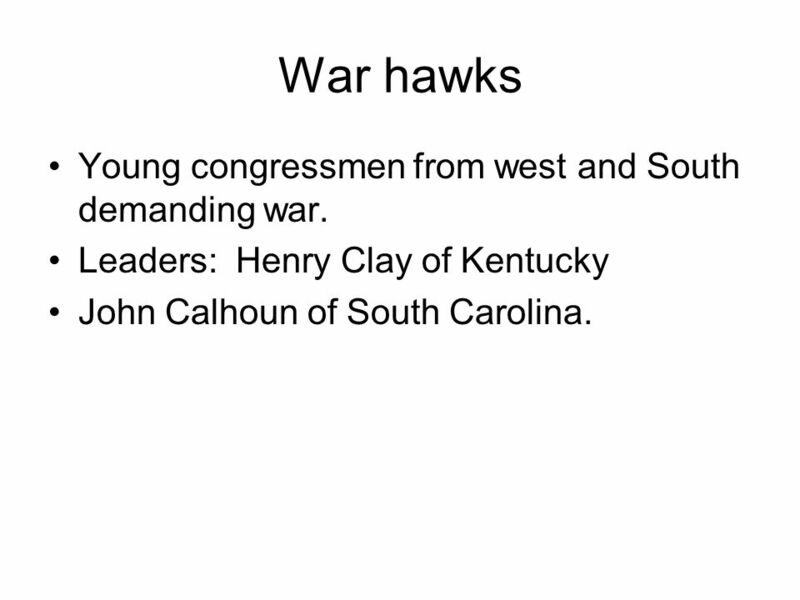 Leaders: Henry Clay of Kentucky John Calhoun of South Carolina. 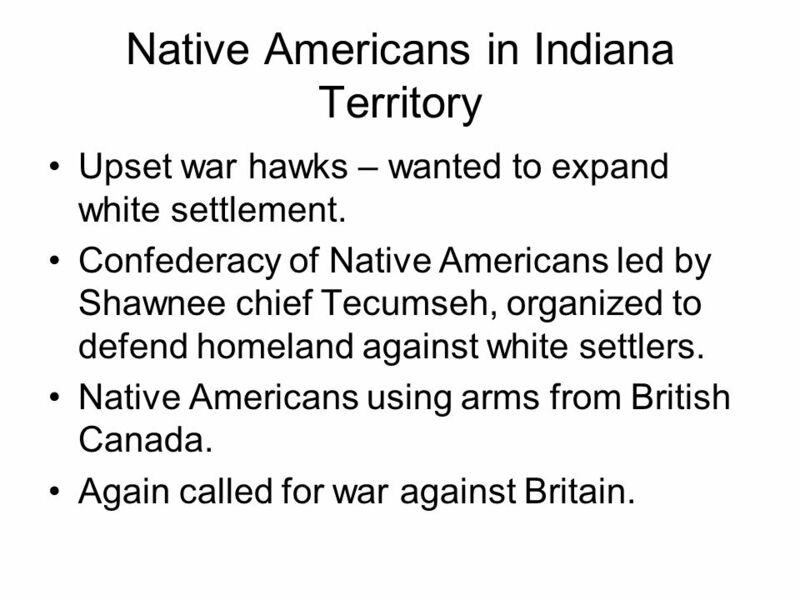 13 Native Americans in Indiana Territory Upset war hawks – wanted to expand white settlement. Confederacy of Native Americans led by Shawnee chief Tecumseh, organized to defend homeland against white settlers. Native Americans using arms from British Canada. Again called for war against Britain. 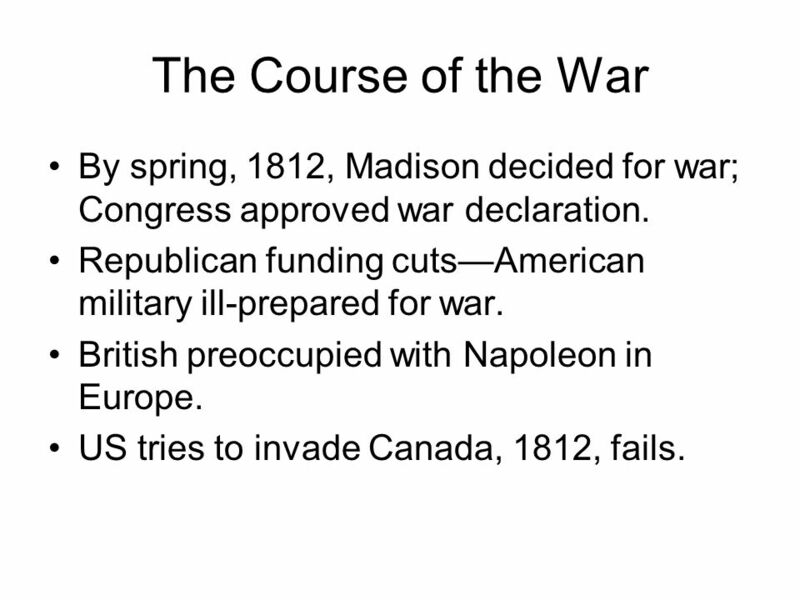 14 The Course of the War By spring, 1812, Madison decided for war; Congress approved war declaration. Republican funding cutsAmerican military ill-prepared for war. British preoccupied with Napoleon in Europe. US tries to invade Canada, 1812, fails. 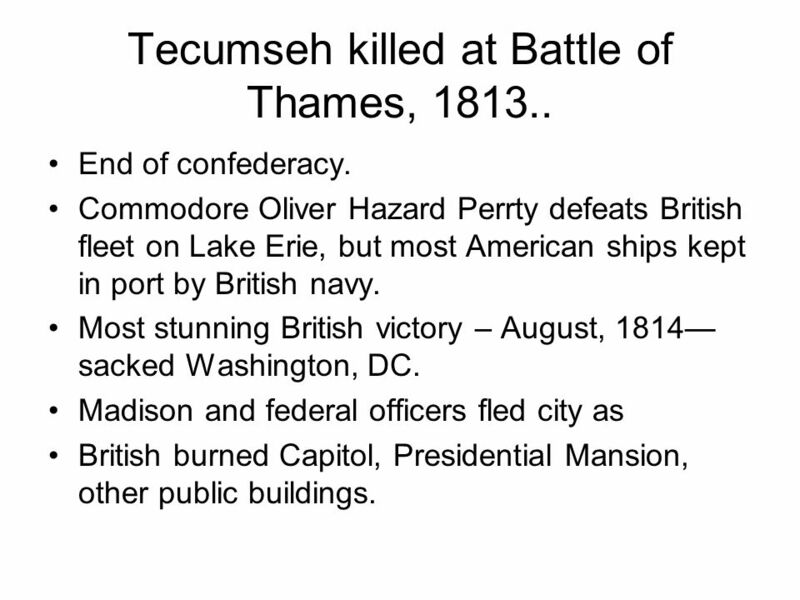 15 Tecumseh killed at Battle of Thames, 1813.. End of confederacy. Commodore Oliver Hazard Perrty defeats British fleet on Lake Erie, but most American ships kept in port by British navy. Most stunning British victory – August, 1814 sacked Washington, DC. Madison and federal officers fled city as British burned Capitol, Presidential Mansion, other public buildings. 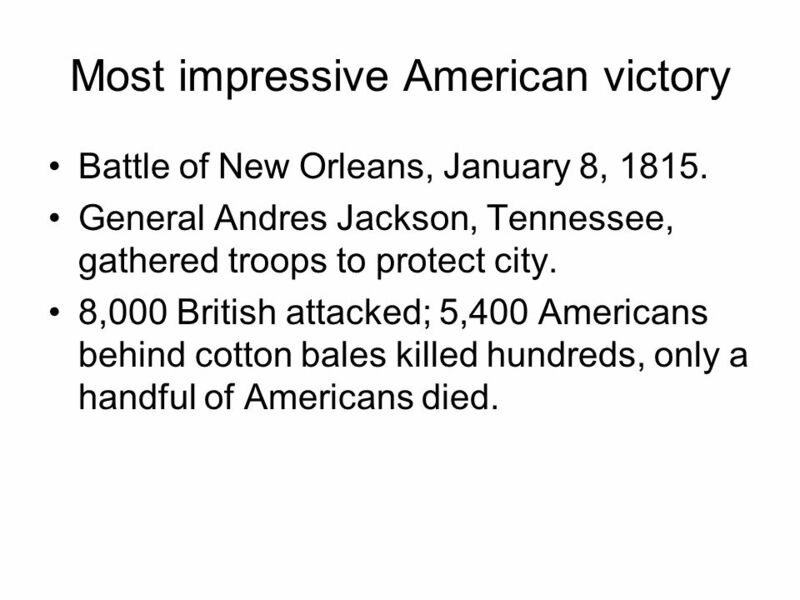 16 Most impressive American victory Battle of New Orleans, January 8, 1815. General Andres Jackson, Tennessee, gathered troops to protect city. 8,000 British attacked; 5,400 Americans behind cotton bales killed hundreds, only a handful of Americans died. 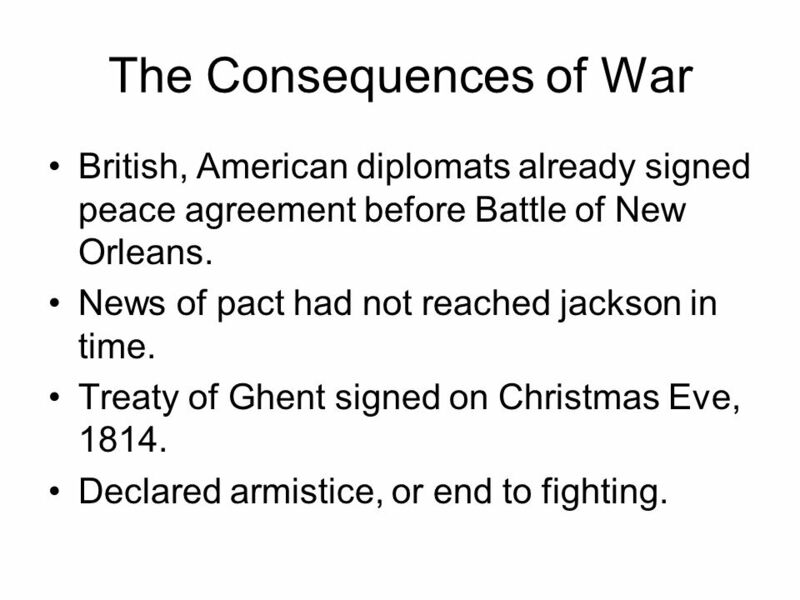 17 The Consequences of War British, American diplomats already signed peace agreement before Battle of New Orleans. News of pact had not reached jackson in time. Treaty of Ghent signed on Christmas Eve, 1814. Declared armistice, or end to fighting. 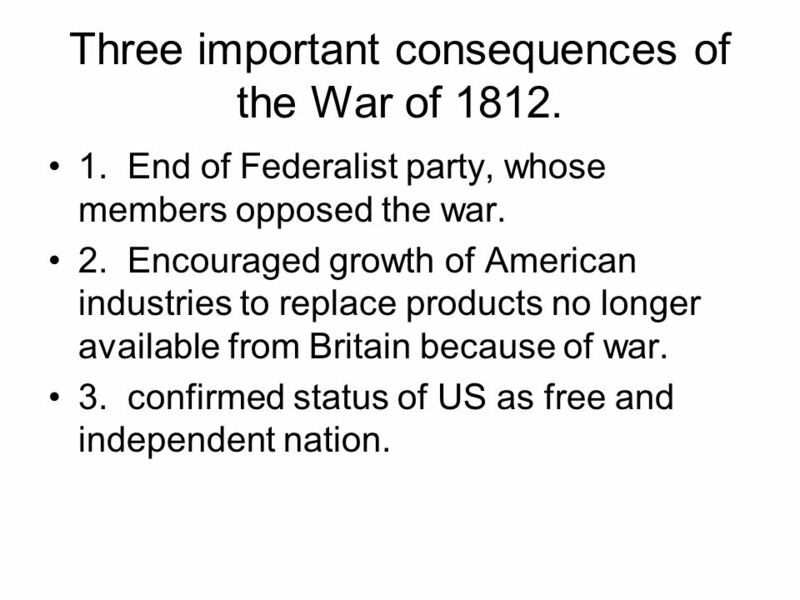 18 Three important consequences of the War of 1812. 1. End of Federalist party, whose members opposed the war. 2. Encouraged growth of American industries to replace products no longer available from Britain because of war. 3. confirmed status of US as free and independent nation. 19 Nationalism Shapes Foreign Policy. President James Monroe, 1816. 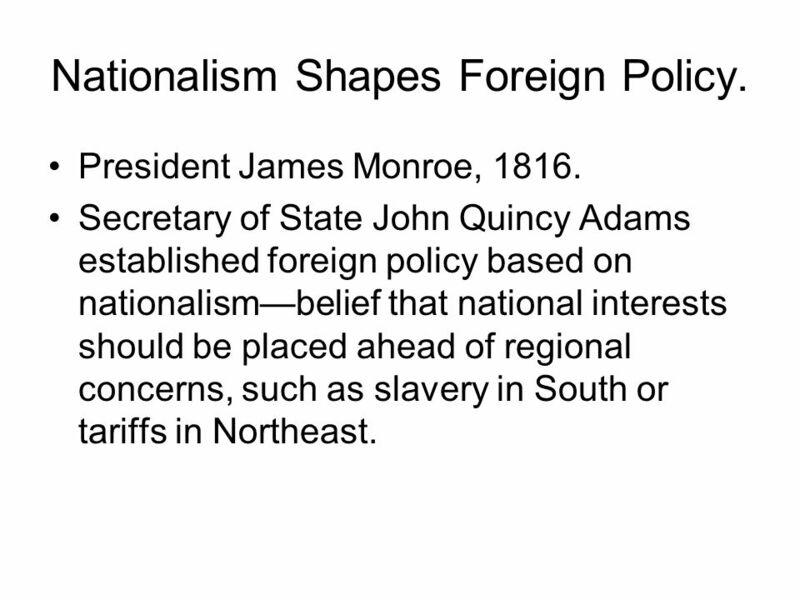 Secretary of State John Quincy Adams established foreign policy based on nationalismbelief that national interests should be placed ahead of regional concerns, such as slavery in South or tariffs in Northeast. 20 Territory and Boundaries Adams list of national interests: Security of nation Expansion of its territory. 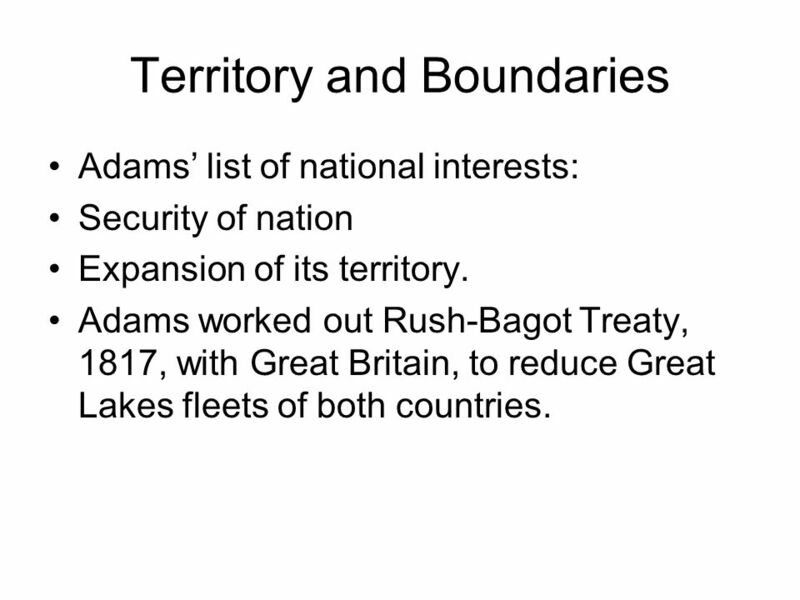 Adams worked out Rush-Bagot Treaty, 1817, with Great Britain, to reduce Great Lakes fleets of both countries. 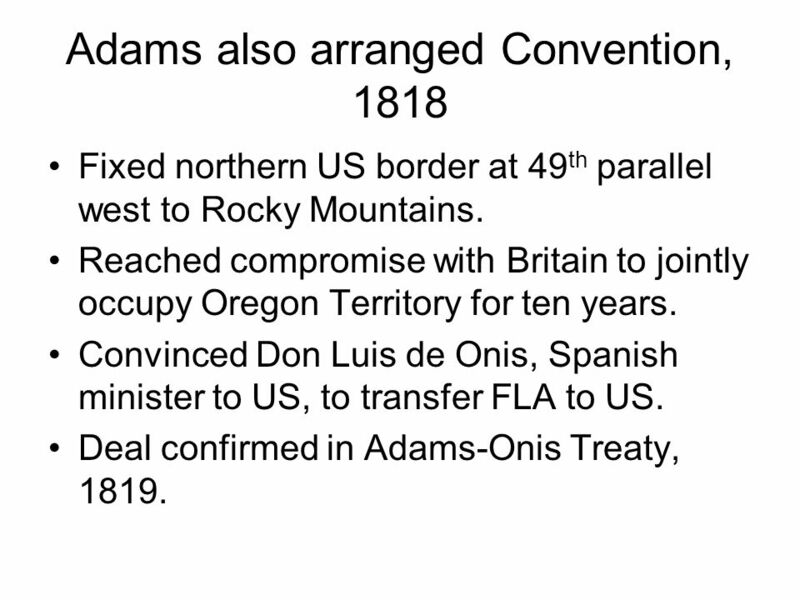 21 Adams also arranged Convention, 1818 Fixed northern US border at 49 th parallel west to Rocky Mountains. Reached compromise with Britain to jointly occupy Oregon Territory for ten years. Convinced Don Luis de Onis, Spanish minister to US, to transfer FLA to US. Deal confirmed in Adams-Onis Treaty, 1819. 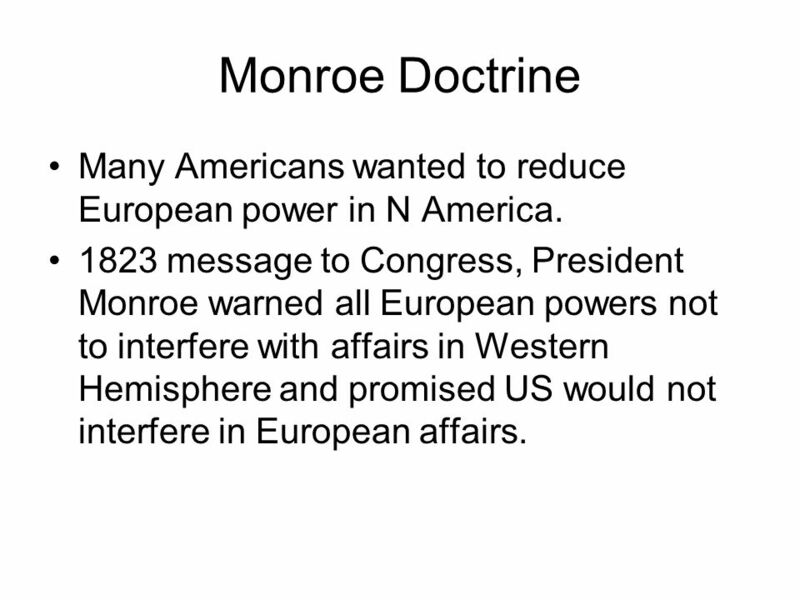 22 Monroe Doctrine Many Americans wanted to reduce European power in N America. 1823 message to Congress, President Monroe warned all European powers not to interfere with affairs in Western Hemisphere and promised US would not interfere in European affairs. 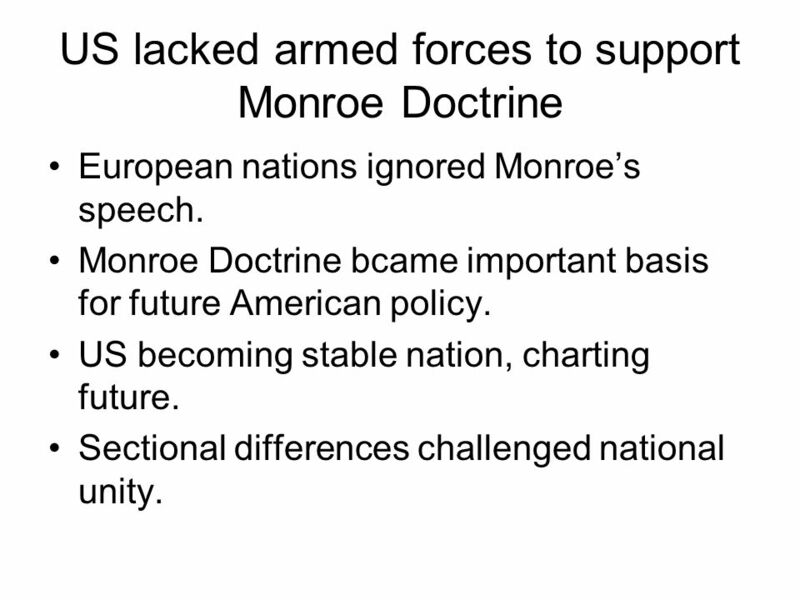 23 US lacked armed forces to support Monroe Doctrine European nations ignored Monroes speech. Monroe Doctrine bcame important basis for future American policy. US becoming stable nation, charting future. Sectional differences challenged national unity. 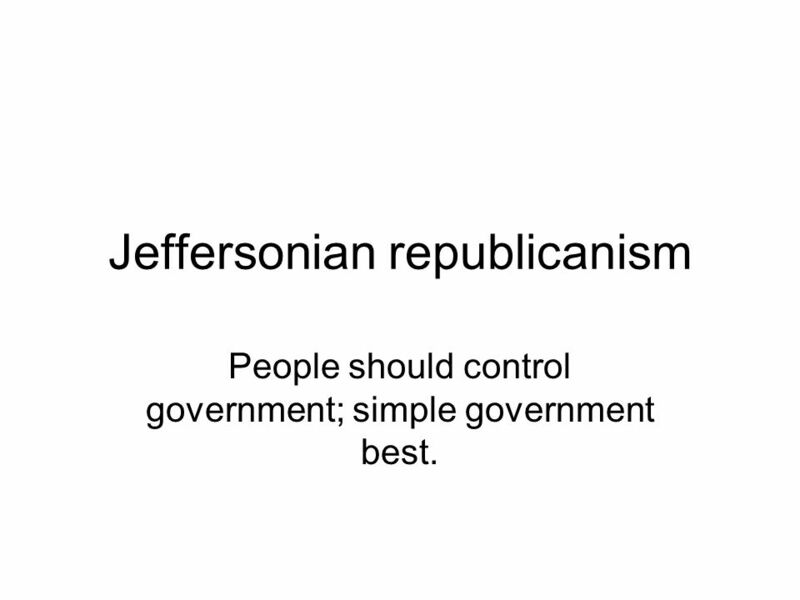 Download ppt "Jeffersonian republicanism People should control government; simple government best." Quiz 3 Review Early American Politics and Expansion. The War of 1812 America’s second war of Independence. Chapter 8.   March 4, 1801  “pomp and circumstance”  Race mixing  Accusations  Educated small farmers A New President. US History Note Page 12 Jeffersonian Era. ELECTION OF Jefferson and Aaron Burr tie for President (candidacy) -both are Democratic-Republicans -Tie. WAR BREAKS OUT BETWEEN GREAT BRITAIN AND THE UNITED STATES …..AGAIN! The War of 1812. The World’s population is expected to reach what number today? Ch.3.  Jefferson vs. Adams----rematch from 1796 election  Thomas Jefferson- leader of Democratic-Republicans  John Adams- incumbent president  Election. Chapter 9 Section 3 A Time of Conflict As American settlers moved west, they took over Native American lands. Also during this period, tens of thousands. The First Five Presidents Notes US 1.7c. George Washington serve d 1789-1797 two terms As President First President under US Constitution Established.